Manipur governor Dr Najma Heptullah lighting the ceremonial lamp at the formal launching of Mission for Economic Empowerment of Traditional Artisans and Craftsmen (MEETAC) at Imphal on September 1, 2018. Photo: DIPR, Manipur. Manipur governor Dr Najma Heptulla, on Saturday, urges people to inculcate the sense of dignity of labour in the region. 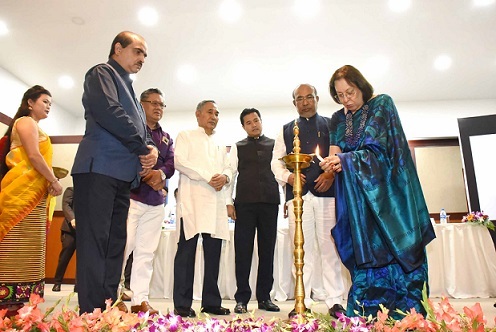 Dr Heptulla was speaking as the chief guest at the formal launching of Mission for Economic Empowerment of Traditional Artisans and Craftsmen (MEETAC) at Imphal. MEETAC, an autonomous society, was set up on December 29 last year under the state textiles, commerce and industries department to provide unified access to the traditional craftsmen, artisans of hills and valley of Manipur for design development of their crafts, arts as per global standards to increase market demand and achieve better economic valuation. She mentioned about the need to include crafts training in the school curriculum so that children are imparted the knowledge of craftsmanship right from the beginning. Stating that Manipur is an unexplored paradise, she said there are many other unexplored potential areas which can be developed in the state. “People of other states should understand that North East does not end at Assam or Guwahati but there are many other places and states which may leave them spellbound,” she said. In his speech, Manipur Chief Minister N Biren Singh said MEETAC is a brainchild of Governor Dr Heptulla adding that many other projects in the state were launched successfully because of her endeavour.